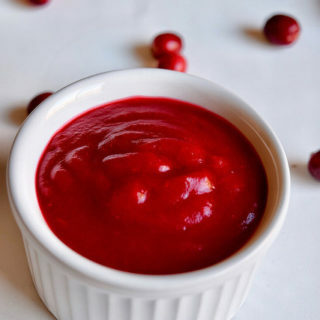 Cranberry Apple Sauce/Cranberry puree – healthy cranberry apple sauce recipe for babies made with fresh/frozen cranberry and apples. Cranberry is a nutritious food for babies as its rich in Vitamin C which helps to improve immunity, They are tart in taste and its the best way to introduce tart taste to the little babies. 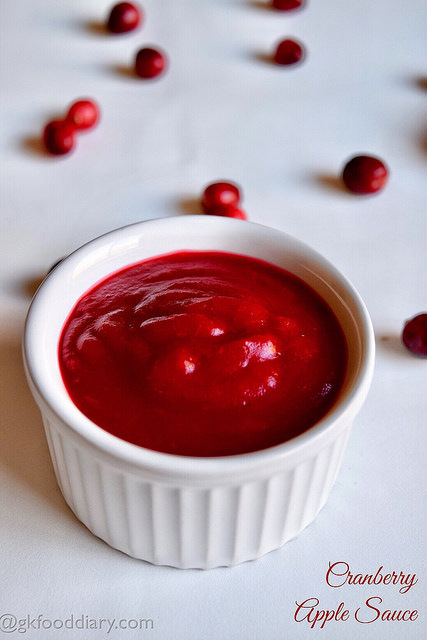 Adding cinnamon and apples to this cranberry sauce helps to reduce the tartness of cranberry and also adds natural sweetness. Read more below on when and how to introduce cranberries and how to select them. Cranberries are less allergic but acidic in nature and hence it can be included from babies diet from 8 months once the baby is introduced to variety of foods. You should watch for allergies after introducing cranberry. If the baby shows any allergic reaction like rashes or tummy upset, stop feeding cranberry. 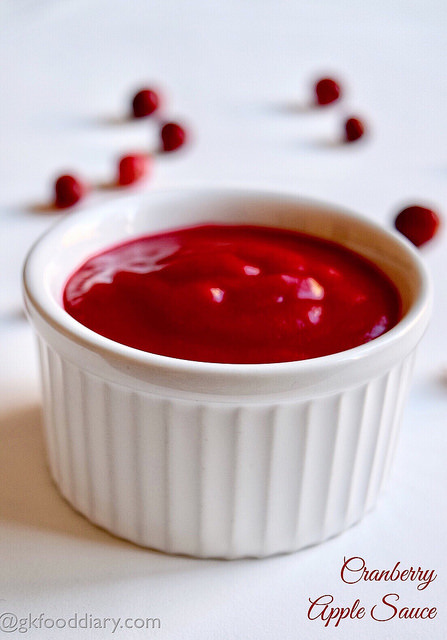 When you introduce, you can offer little amount of cranberry puree/cranberry sauce and then gradually increase the quantity and shift to mashed cranberry. Raw cranberries are not suitable for babies and hence it should be always cooked or baked if given to small babies. If the baby does not prefer tart taste of the cranberry, it can be combined with little spice or sweet fruits like apple or banana to reduce the tartness. 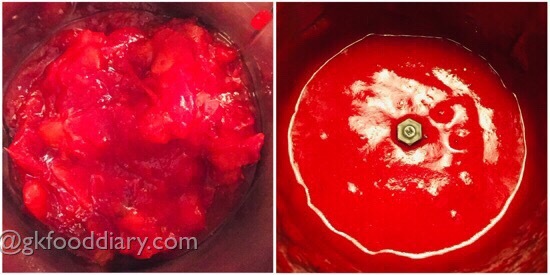 Here is how to make cranberry apple sauce recipe for babies. 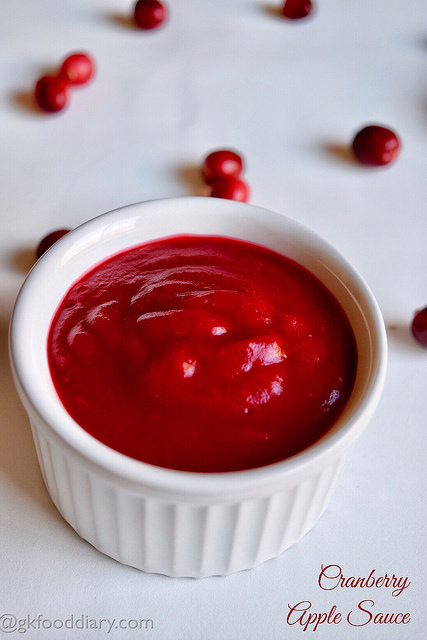 Cranberry apple sauce - Easy puree recipe for babies with cranberries and apples. Wash the cranberries in running water thoroughly and strain the water completely using a sieve or colander. Set aside. Wash and peel the apples. Cut them into cubes and keep it ready. Take water in a sauce pan, add a small piece of cinnamon and bring it to a boil. Then add in the washed cranberries and cubed apples to the boiling water.Cook the cranberries and apples covered in water for 5 minutes or until the skins are coming off from the cranberries. Once done, switch off the flame. Cool it down. Remove the cinnamon piece from the cooked mixture and transfer the cooked apple and cranberries to a blender. Grind it to a smooth paste. Add the water which is used for cooking to reach the desired consistency while grinding. You could also mash it with potato masher instead of grinding. 1. 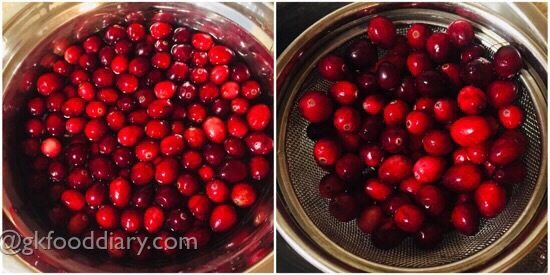 Wash the cranberries in running water thoroughly and strain the water completely using a sieve or colander. Set aside. 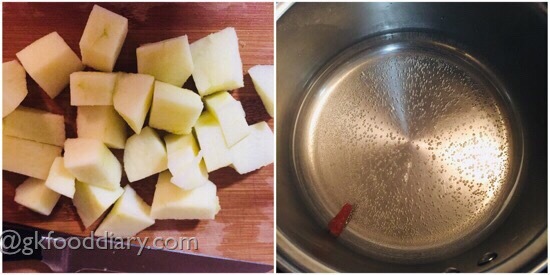 2.Wash and peel the apples. Cut them into cubes and keep it ready. Take water in a sauce pan, add a small piece of cinnamon and bring it to a boil. 3. 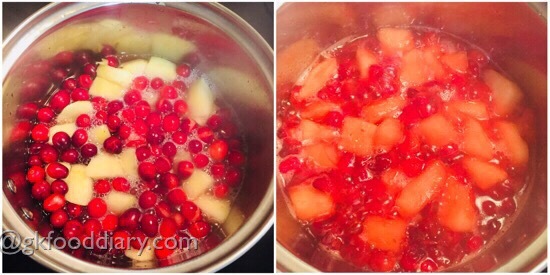 Then add in the washed cranberries and cubed apples to the boiling water.Cook the cranberries and apples covered in water for 5 minutes or until the skins are coming off from the cranberries. Once done, switch off the flame. Cool it down. 4. Remove the cinnamon piece from the cooked mixture and transfer the cooked apple and cranberries to a blender. Grind it to a smooth paste. Add the water which is used for cooking to reach the desired consistency while grinding. You could also mash it with potato masher instead of grinding. Feed the cranberry apple sauce to your baby! Make sure to remove the cinnamon piece before grinding into puree. Check with your baby’s doctor before introducing cranberry to your baby. 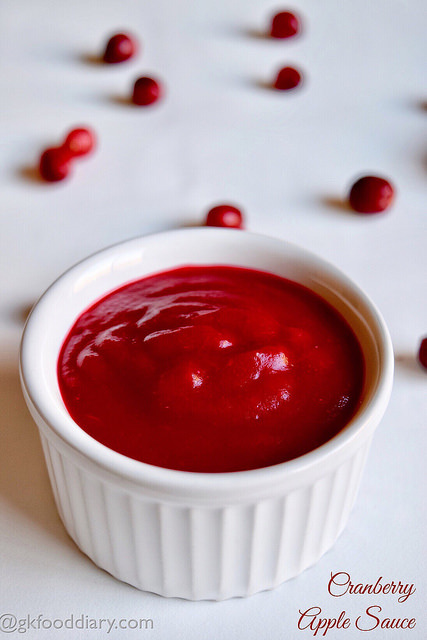 Introduce apple separately before e you try this cranberry sauce to your baby. 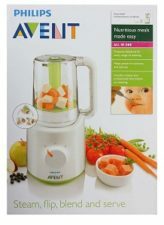 You could also mash it with potato masher instead of grinding the cranberries and apples.